As Archangel slices open Nanny's armor, shocked to find a person inside, Marvel Girl uses her telekinesis to bring the vehicles down safely. As Orphan Maker tends to the injured Nanny, Marvel Girl locates Nanny's Lost Boys and Girls, including Marvel Girl's niece and nephew, hidden aboard her ship. However, the children have been brainwashed by Nanny, and when Marvel Girl demands she set them right, Nanny teleports away with Orphan Maker. Later, X-Factor turns over the infants, as well as Nanny's erstwhile charges, to Freedom Force, who say the government has already begun locating their parents. Returning to Ship, Marvel Girl's niece and nephew are reunited with their grandparents, which seems to jog their memory. Her parents agree to take the children in, and Jean says that a peaceful, normal life is what they need. Rob Liefeld contributes his first work to an X-book with this issue, filling in in the wake of Walt Simonson's departure. He will, of course, eventually be assigned as the regular penciller of New Mutants and end up shepharding that title's transformation into X-Force in a few years time, before leaving Marvel entirely to co-found Image Comics and star in Levi's commercials. His work here isn't bad - or, at least, not as bad as it could be/will be. 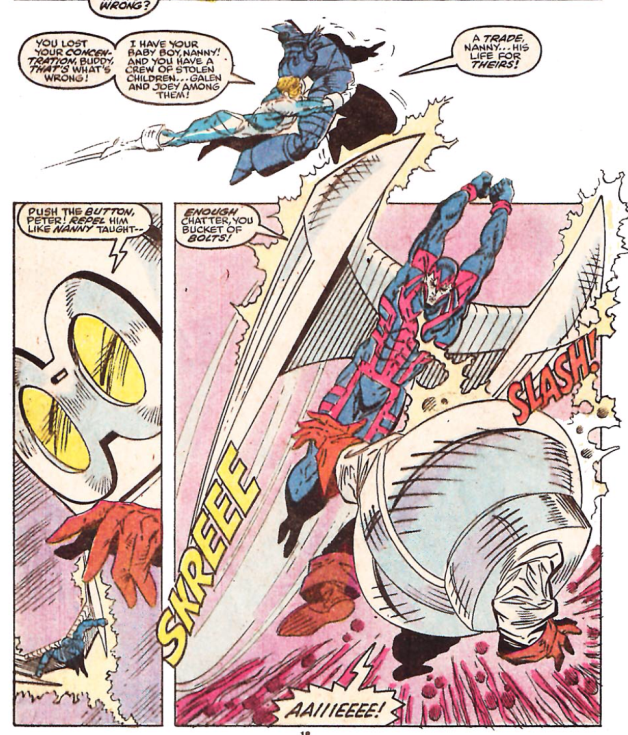 Al Milgrom remains on hand as inker and perhaps, in a rare case of Al Milgrom improving the art instead of worsening it, his presence helps reign in Liefeld's more problematic tendencies. That said, some of Liefeld's stylistic hallmarks are in full swing: Marvel Girl's hair is HUGE throughout the issue, backgrounds occasionally disappear and are replaced by colored or white space, and the panel-to-panel flow, particularly in the action sequences, becomes hard to follow, with characters' placement relative to each other and their setting often a mystery. 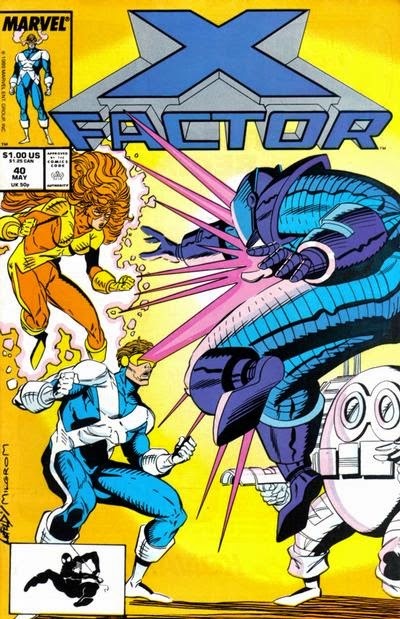 The issue opens immediately after Madelyne Pryor's funeral, and it's mentioned that X-Factor recently attended Candy Southern's funeral as well (a reminder that the events of "Inferno" only spanned a few days, even though Candy died six issues ago). Nobody but X-Factor attended Maddie's funeral, and it's said that, by design, she had no life outside of X-Factor and the X-Men. Which, while true per the "Inferno" retcons, is still kind of sad. And, of course, the X-Men don't attend, because of reasons. Artie, Leech and Wiz Kid are all said to be returning to school (and this is the last we'll see of them until the "Kings of Pain" story in the 1991 annuals), while the older kids are remaining on Ship, as their school doesn't want them back for fear of future "incidents" involving them. At the end of the issue, Rusty is furloughed on his and X-Factor's recognizance pending his trial, preventing him from having to go back to jail. However, this won't stop Freedom Force from coming after him again in future New Mutants issues. The children kidnapped by the demons throughout "Inferno" are turned over to the government by way of Freedom Force, and though it's said here that most of their parents have already been contacted, a later story in the revived New Mutants title will reveal that the mutant babies were actually turned over to the army and used in an effort to take control of Limbo. Nanny's origin as a mutant scientist for the Right turned rogue is recounted by Orphan Maker. It's also established that Nanny took Orphan Maker from Mr. Sinister's orphanage, though nothing ever really comes of this. We are, unfortunately, not done with Nanny and the Orphan Maker quite yet, as both will next pop up in X-Men in a few months' time. Marvel Girl's niece and nephew, Joey and Gailyn (or "Galen" in this issue), are rescued from Nanny this issue and turned over to their grandparents for care. Cyclops promises they'll find Jean's missing sister, the kids' mother, as well, though they never actually do. Joey and Gailyn mostly fade into obscurity from this point forward, until they're killed off along with the rest of the Grey family in the early 00s story "End of Greys". The Statement of Ownership in this issue lists the average number of copies of each issue sold during preceding 12 months to be 491,380, with the single issue nearest to filing date selling 418,490. Angel's pink and blue costume is seen beneath his tuxedo, further suggesting that's his skin now and not a costume (though we'll eventually learn it is just a costume). In the wake of his encounter with N'astirh, Taki says his ability to reshape matter remains, but is weaker than it was before. It's revealed that all the children at Mr. Sinister's orphanage have been freed. Throughout the issue, the characters seem confused as to whether or Nanny is robot. Marvel Girl, who realized in issue #35 that Nanny was a low level telepath, refers to her as both a robot and "her", and Archangel is later shocked when Nanny screams after he attacks her. Nanny quotes a nursery rhyme I had to look up. It's from Halliwell’s “Nursery Rhymes of England” called “One-ery Two-ery”. 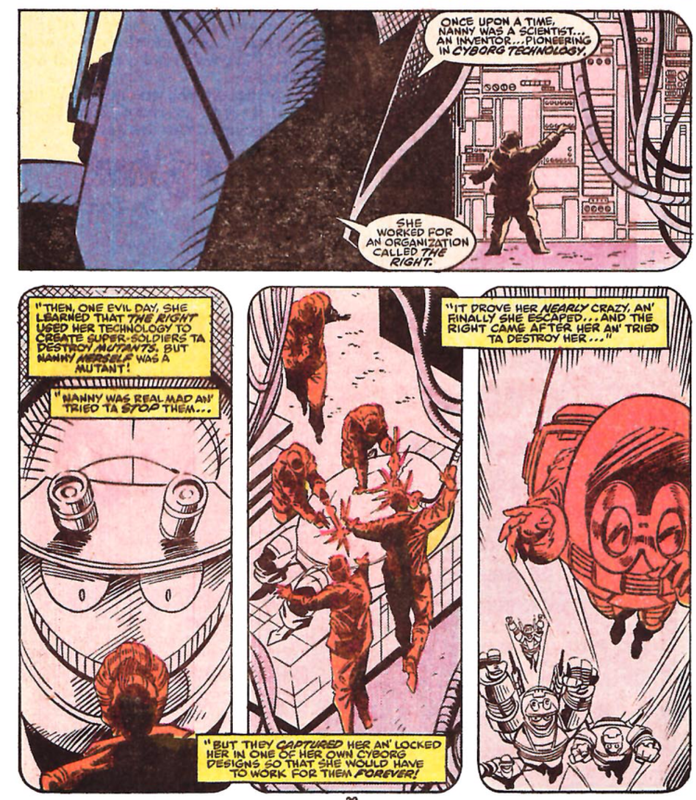 Credit where credit is due: the two panel sequence that shows Cyclops facing off against Orphan Maker as Nanny zooms in through a hole in the ship, is the kind of dynamic layout that made Liefeld an exciting (and popular) despite his many, many fundamental flaws (Archangel's attack on Nanny, pictured in the plot synopsis above, is another such instance). The letters column in this issue run a pair of longer letters, written circa issue #32, one expressing the belief that Scott and Jean belong together, the other a defense of Cyclops which, amongst other things, points out the whole "Madelyne didn't ask Roma to reunite her with her son" thing that's been mentioned here a few times. Of the three series which handled the bulk of the main "Inferno" narrative, this issue stands as the one structured most like a traditional epilogue to a big, long-running storyline. We get the funeral of Maddie (or, at least, its immediate aftermath), and while the character deserved better (and continues to be slandered somewhat in death), hey, at least her death is acknowledged and we're told she was respectfully laid to rest. After that, we get the obligatory (but necessary) check-in on the book's cast post-crossover (the kids are back, though the youngest are returning to school, Rusty's been furloughed, etc.) along with a wrap up to some of the storyline's lingering threads (the kidnapped babies are turned over to the government). For the obligatory action scenes, we get the return of Nanny and the Orphan Maker, which adds a nice bookend to "Inferno" (as they were the villains fought in the issue just prior to the crossover's beginning, and participated on the fringes of "Inferno") and also ties up the thread of Marvel Girl's kidnapped niece and nephew, further adding to the epilogue feel of the issue. All in all, it's an effective "taking a breath" story, allowing the significant happenings of the past few months some time to sink in, for the characters and readers. Certainly, it's much better than any issue featuring Rob Liefeld on art and Nanny and the Orphan Maker as the antagonists has any right to be. Next week, Cyclops takes the spotlight in Marvel Comics Presents #17-24, followed by Excalibur #8 and Wolverine #7. Well, at least Maddie got some type of funeral. Couldn't they have at least invited Scott's grandparents? Good to see Liefeld's "tics", even in his early art, are present and accounted for. It's weird, because early Liefeld, such as this, doesn't really look that awful to me. It looks like the work of a talented artist-to-be who just needs to hone his craft a bit more. I think the inking of old-timers like Milgrom probably helps to offset Liefeld's problems, as you note. Also -- I like Jean's hair in that panel you posted. I think I said before, I love when female characters are drawn with big hair like this. It's dynamic. @wwk5d: Couldn't they have at least invited Scott's grandparents? @Matt: It looks like the work of a talented artist-to-be who just needs to hone his craft a bit more. Definitely. The talent is there, it just needs some sharpening. And then he hits it big, becomes a superstar...and never bothers to hone his craft. Also -- I like Jean's hair in that panel you posted. To be clear, so do I. At the same time, it's an effect I associate with him, so it went into the "Liefeld tics" comment. Frankly, there's a lot of stuff about Liefeld I DO like. We'll get into this more once he comes aboard New Mutants, but certainly as a kid I liked him way more than a lot of his non-Image contemporaries at the time. There was an energy and dynamism to his work that I loved. I only started noticing the flaws, stuff like the lack of backgrounds, wonky anatomy and dicey sequential storytelling, as I got older and gained a better appreciation for comic art as a storytelling device and not just static images accompanying the text. As a kid, I didn't care that he couldn't/wouldn't draw feet, because I wasn't looking at characters' feet. Yeah, every character had metal arms and flashing eyes and an obscene number of pouches, but it was 1992 and I was twelve and all that crap was kewl as hell. "I honestly don't think we ever see or hear from them again." The only time I think we ever see them again is in X-men Vol 2, in the early 20s, when Cyclops visits them after not being able to deal with the Jean/Psylocke non-triangle. Which is also when he learns Sinsiter really wasn't dead. Liefeld's art at the time did have a certain energy, and dynamic aspect to it. And...that is all I can say about it in hindsight. 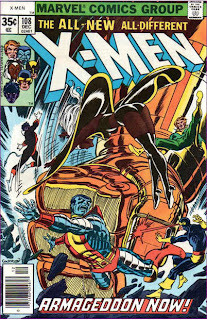 Philip and Deborah Summers also appear just before "Legion Quest" in X-MEN #39, in what I recall was a fairly touching story where Philip crashes his plane while doing some recrational flying, and is found by the man who is obviously his unknown third grandson but isn't actually his unknown third grandson, Adam-X. Philip goes blind that issue, but Adam-X lets him mentally see what it's like to pilot a starship before leaving. After that, I don't recall ever seeing them again for the duration of my time reading the X-books. You'd think they might have popped up when Steven Seagle sent the original five X-Men to Alaska for some R&R during his run on UNCANNY, but I don't think they appeared then. Based on this appearance plus the one wwk5d mentioned, it seems Fabian Nicieza was the only writer who remembered Cyclops's granparents existed and/or had any interest in using them. Oh, and their creator, Chris Claremont, remembered them, of course, using them in X-MEN FOREVER. What happens to Scott & Maddie's baby? Do they keep it on Ship? Oh, and regarding Liefeld -- I liked him a lot too back then. If you had asked me, circa 1991, who was my favorite of the rising Image artists, Liefeld would probably have placed second behind Jim Lee. Even today, as he's fallen to the bottom of that list of the original Image guys, he still places above Todd McFaralane for me. "The children kidnapped by the demons throughout "Inferno" are turned over to the government by way of Freedom Force, and though it's said here that most of their parents have already been contacted, a later story in the revived New Mutants title will reveal that the mutant babies were actually turned over to the army and used in an effort to take control of Limbo." It was revealed in New Mutants 78, just a few months after this story, that Freedom Force lied about the parents. Annoyingly, the X-teams do nothing about this- there's literally dozens of scenes over the next 6 or 7 years where they have chances to ask Mystique or Blob who they gave the babies to but don't. "Don't bring babies in battles with trolls". Ah, Liefeld...This issue was, not only his first X-contribution, but, also his first published Marvel work. Because of this, I remember it having a bit of a higher price tag on it in the price guides back in the day. Ahh...the '90s...the era of collectibility. RE: Scott's grandparents...what wwk5d and Matt said. 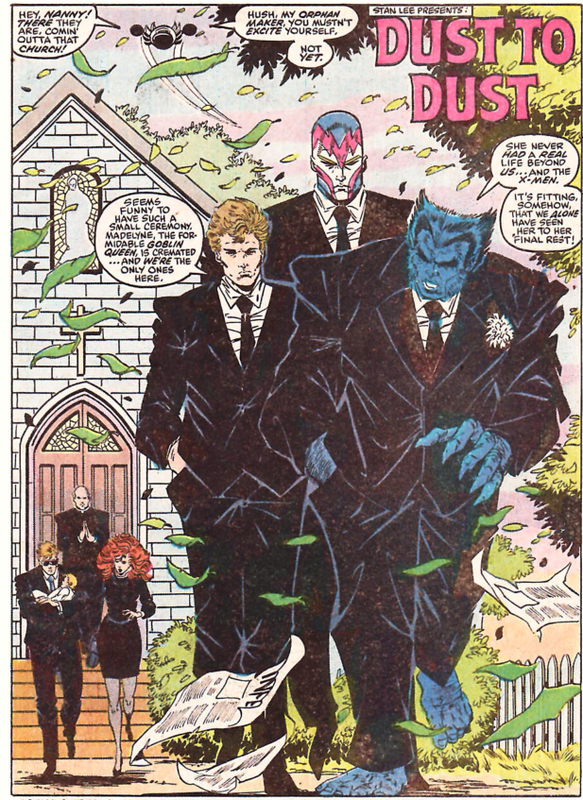 They were, also, in attendance at Scott and Jean's wedding in issue #30. I believe that makes three appearances during Nicieza's run. Yes. Baby Nathan stays put as part of the supporting cast and will remain so until issue #68 when he's infected with a techno-organic virus by Apocalypse and Scott is forced to send him to the future with the Askani to save him. Within the next year, it would be retroactively revealed that Cable is, in fact, the adult Nathan Summers returned from the future. Anonymous: X-Factor doesn't really grasp the basics of taking care of babies, like "Don't hand babies over to criminals who sent their daughters after the Avengers" and "Don't bring babies in battles with trolls". Well. What should one expect when all of them have been drafted to the X-teams as teens with the pretense of providing them education and learning to use their powers, but factually continuously thrown against every imaginable mutant villain and if the parents of any younger one tried to raise ado over something there's always a telepath around to change their perception over the happenings of the night because "everyone has had a long night and no one needs this". The world of X is all about sending kids after superpowered enemies and handing them over to criminals. I for-sure noticed at least a couple of rough transitions where the dialogue had to spell out what the art failed to indicate, with Beast jumping and/or being thrown into the console the most egregious. Possible '80s to love, complete with play on words: Nanny's monitor observing Ship appears to be a TRS-80. I'm not saying it actually is one; just pointing out how for the most part it's better to go the Kirby route of rendering even more mundane gadgets in ridiculously futuristic detail than to have specialized equipment resemble contemporary technology, because it will get dated. His exact words are "eventually we'll find her," which strikes me as hilariously nonchalant and/or pessimistic. "Your sister will turn up; don't worry. And since we're living in Marvel Time she won't have been gone for too long. Probably. Look, I dunno. Caring about women's whereabouts is not exactly my thing." I didn't know that one, either, which I think makes me at least zero for two. Yeah. I remember once lamenting his art especially because, if you looked at his early work on Hawk and Dove at DC, he could clearly draw feet properly if he wanted to, etc., and I was told by someone in a position to know how the original pencils looked that it was basically Karl Kesel (not exactly an old-timer) doing whatever he could to salvage those pages while inking. That being said, I did see certain poses and panels in this issue that showed promise in terms of his design. That being said, Scott is either sneering or looking surprised or both for at least the first half of the issue, and Jean's parents are just horrible. The first place I saw his stuff was on Infinity Inc., at the time one of my favorite series, when he had the impossible task of following a too-short stint from Don Newton after Newton's death and right before that Jerry Ordway; so, two of my favorite artists. Honestly, I thought his layouts were intriguing, despite needing to be reined in, and I chalked up most of how ugly the actual art was the inker, whose inks I knew I didn't like on other pencilers including himself. Soon enough, however, I realized that you almost couldn't make McFarlane's pencils any worse. I too would take Liefeld over McFarlane, if absolutely necessary. So... it has been, what, 3 of 6 original Imagers who have been featured in X-aminations this far? Erik Larsen is not bound to pop up at any point so I think this is the appropriate point to mention that of those six Erik Larsen on one of them Spider-Man books was to me back then the hardest to get accustomed to. The others had at least something new interesting thing to bring, meanwhile Larsen was just cartoony. Technically, there are 7 original Imagers, and we've seen 4, so far. Whilce Portacio inked the LONGSHOT mini-series (we've yet to see him pop up as a penciler). Marc Silvestri is, of course, penciling the mothership. Todd McFarlane has only had a tangential relationship to the X-Books with the INCREDIBLE HULK and AMAZING SPIDER-MAN issues he illustrated that tied in to X-crossovers. This week, marked Rob Liefeld's X-debut. In fact, he will. Not as an artist, though. Larsen was writing WOLVERINE during the 1999-2000 time frame. If Teebore sticks it out that long, he'll be covered. Congrats, Cerebro! :D By two minutes you beat me, I was just coming to correct myself that Portacio has guest inked an NM issue and UXM #201, and Larsen might possibly pop up with the Spidey issue where Wolverine guest stars against a very forgettable gang of female villains as the penciler or inker if Teeb is to X-amine that one. Larson does do an issue of Spider-man (adjectiveless) that guest stars Beast. Does that count? Not sure if anyone else has suggested it, but you should add that weird hunched-stance thing that Jean's doing in your sample panel (the one with the awesome huge hair) to the artist tics. It's very much a Liefeld thing. 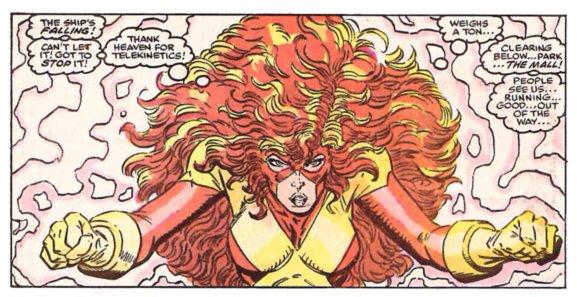 And yeah, add me to the people who like Liefeld's impressive manes of hair on his heroines. I grew up in the 80s, so I'm inclined towards huge hair. "Joey and Gailyn mostly fade into obscurity from this point forward, until they're killed off along with the rest of the Grey family"
"End of Greys" had to be the darkest thing Claremont ever wrote for a mainstream comic. Wasn't the plot of the issue that they Greys are having a happy family get-together and some aliens come in and murder all of them in sixty seconds? I do remember liking the narrative device of every panel in the issue marking one second, but what a depressing story! I've sometimes wondered if this was Claremont's way of trying to prove he could do the sort of grim, mirthless superhero comics that all the other writers of the 00s seemed to favor (and to some extent, still favor). Blam -- "The first place I saw his stuff was on Infinity Inc., at the time one of my favorite series, when he had the impossible task of following a too-short stint from Don Newton after Newton's death and right before that Jerry Ordway; so, two of my favorite artists." This wasn't my first exposure to McFarlane, having picked it up later, but -- I experienced a similar feeling the first time I read "Batman: Year Two". Gorgeous Alan Davis artwork for chapter one, then hideous McFarlane stuff for the rest of the thing! It's no wonder I've only read that story one time, despite owning it in trade paperback format. Teemu -- "The others had at least something new interesting thing to bring, meanwhile Larsen was just cartoony." Taking into account that the term "cartoony" can mean different things to different people, I loved Erik Larsen as a kid precisely because he was cartoony -- but in a good way (unlike McFarlane, who I thought was the cartooniest of all the Image guys, and didn't do it well at all). Maybe he was before his time, since ultra-cartooniness really came into vogue a few years later with Joe Madureira and the like (though I think I said before that Bret Blevins seems like a precursor to that style as well). Though I think Jim Lee was cartoony in his own way too, with his subdued manga influences. Nowadays Larsen has gone too "full-on Kirby" for me (not that I dislike Kirby; I just don't think Larsen pulls the pastiche off very well). But I adored his work on AMAZING SPIDER-MAN and SPIDER-MAN. And give that "Spidey issue where Wolverine guest stars against a very forgettable gang of female villains" another try sometime! It's a short MARVEL COMICS PRESENTS serial written and drawn by Larsen, and it's pretty darn funny. He even works in an unexpected guest appearance by a grown-up Billy Batson. Matt: And give that "Spidey issue where Wolverine guest stars against a very forgettable gang of female villains" another try sometime! It's a short MARVEL COMICS PRESENTS serial written and drawn by Larsen, and it's pretty darn funny. He even works in an unexpected guest appearance by a grown-up Billy Batson. Ah. My memories got messed up the bit there, the MCP story is the one I'm talking about, but Band of Baddies in that story went only later on to fully develope into Femme Fatales, the woman team I was thinking about that has 2/4 Baddies in it. And if I'm correct now, Knockout was not in the Spidey/Wolvie story but alongside Mindblast a later addition to original Baddies Whiplash and Bloodlust. Other Baddies were not-Blob I mean Critical Mass and, ha, Savage Fin, who Larsen apparently didn't give away to Marvel :D (they probably felt they had one already in the Inhuman Royal Family). Other than that, Knockout and Bloodlust look like people who would on their part too have been happier at Image. Teebore, the popular demand is there, this MCP story needs to be covered. I seem to have been a bit hasty in my assessment. @Matt: Philip and Deborah Summers also appear just before "Legion Quest" in X-MEN #39, in what I recall was a fairly touching story where Philip crashes his plane while doing some recrational flying, and is found by the man who is obviously his unknown third grandson but isn't actually his unknown third grandson, Adam-X. Oh yeah, I remember that. For some reason, I had attributed that to Corsair and Adam-X (THE X-TREME)in my head, but it's definitely Phillip. If you had asked me, circa 1991, who was my favorite of the rising Image artists, Liefeld would probably have placed second behind Jim Lee. Even today, as he's fallen to the bottom of that list of the original Image guys, he still places above Todd McFaralane for me. He probably would have been second for me as well, followed by Silvestri. I've never had a strong opinion on MacFarlane either way (certainly not as strong as everyone else's), Portacio was okay, and I've never been a huge fan of Erik Larsen. I honestly don't think I've ever seen much Valentino art. @Anonymous: It was revealed in New Mutants 78, just a few months after this story, that Freedom Force lied about the parents. Annoyingly, the X-teams do nothing about this- there's literally dozens of scenes over the next 6 or 7 years where they have chances to ask Mystique or Blob who they gave the babies to but don't. Technically, isn't it the New Mutants who do nothing - including, as far as we know, telling any of the other mutant teams - about it? I mean, they know Freedom Force was lying, and presumably could have told someone about it, but it seems like a ball they dropped and everyone else was just living in blissful ignorance that the babies were with their families. @Cerebro: Ah, Liefeld...This issue was, not only his first X-contribution, but, also his first published Marvel work. Because of this, I remember it having a bit of a higher price tag on it in the price guides back in the day. Ahh...the '90s...the era of collectibility. That, I did know. Though I don't think this ever got as high as some of his NM work. Certainly not as "valuable" as the first appearance of Cable became in the 90s. Not as an artist, though. Larsen was writing WOLVERINE during the 1999-2000 time frame. If Teebore sticks it out that long, he'll be covered. @Blam: "Your sister will turn up; don't worry. And since we're living in Marvel Time she won't have been gone for too long. Probably. Look, I dunno. Caring about women's whereabouts is not exactly my thing." Scott is either sneering or looking surprised or both for at least the first half of the issue, and Jean's parents are just horrible. Maskless faces, like feet, are not a Liefeld strong suit. I remember a scene in an upcoming NM issue where he does that "faces on computer screen status report" trick, and it's all maskless people. If not for the different hair styles, they'd all look exactly the same. And yeah, Jean's parents are bizarrely drawn throughout this issue. @Mela: And yeah, add me to the people who like Liefeld's impressive manes of hair on his heroines. I grew up in the 80s, so I'm inclined towards huge hair. That's actually a good point - the hair may be huge, but in the late 80s, it's not so outlandish. Also, yeah, that hunched stance is definitely a Liefeld thing, though a lot of the over Image artists (and post-Image Exodus copycat artists) do it on occasion too. @Teemu: Teebore, the popular demand is there, this MCP story needs to be covered. I seem to have been a bit hasty in my assessment. Somebody throw me the MCP issue numbers and I'll see if I can work it in. Democracy in action! "Technically, isn't it the New Mutants who do nothing - including, as far as we know, telling any of the other mutant teams - about it? I mean, they know Freedom Force was lying, and presumably could have told someone about it, but it seems like a ball they dropped and everyone else was just living in blissful ignorance that the babies were with their families." What happens in this- Freedom Force grabs Rusty and Skids to keep them from telling X-Factor. 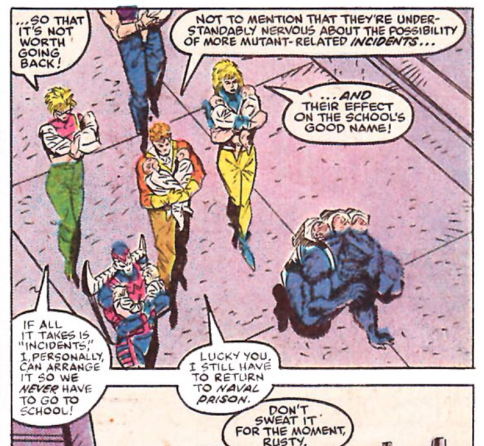 In New Mutants 88, the New Mutants tell X-Factor that Rusty and Skids have been grabbed by Freedom Force. 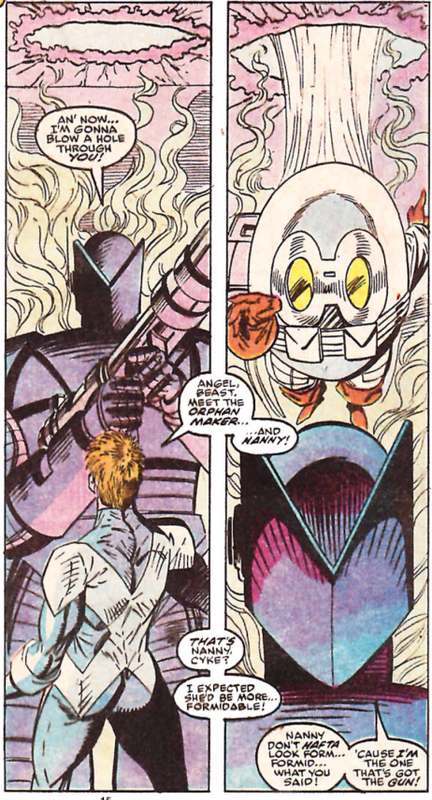 One would think that X-Factor would have asked *why* Freedom Force grabbed Rusty and Skids. Teebore, it's MCP #48-#50. Though now I'm having second thoughts because the 90's is drawing on us and Wolverine gets to guest star A PLENTY from here on, and not least with Spider-Man so do you want to set such a precedent? There's also the adjectiveless Spider-Man Wendigo-story by McFarlane coming up; the "new" "Fantastic Four" with Spidey, Hulk and Ghost Rider; all that Hearts of Darkness business with Punisher and Ghost Rider... if it wasn't for Berlin, we could have pinned the endless Wolverine's guest appearances too on the Image guys. @Teemu: it's MCP #48-#50. Though now I'm having second thoughts because the 90's is drawing on us and Wolverine gets to guest star A PLENTY from here on, and not least with Spider-Man so do you want to set such a precedent? Thanks. I'll take a look and see when it was published relative to other stories and whether I can fit it in (and give it the once over to see if I think it's worth fitting in). "Torment" - No (it's chiefly a Spider-Man story, and not a very good one). New Fantastic Four - yes (because Art Adams). Hearts of Darkness - maybe (I've never read them). @Anonymous: One would think that X-Factor would have asked *why* Freedom Force grabbed Rusty and Skids. "Ours is not to wonder why..."
Seriously though, I had forgotten the details of Rusty and Skids getting captured. It does make X-Factor's, at least, lack of action a bit more damning. Teebore: Thanks. I'll take a look and see when it was published relative to other stories and whether I can fit it in (and give it the once over to see if I think it's worth fitting in). It's a yet another Image guy having a go at Wolverine, so there's that, plus I really liked how the X-Men being dead to the world at the time was an acknowledged element in the story. Spidey gets a dose of paranoia after he doesn't find Wolverine showing up in any of the pictures he had taken during the shenanigans. Hilariously, as the story was printed for me in our regular local Spidey-book and by Larsen, I naturally thought it to be an Amazing issue, but upon checking it up and finding no Wolverine among the participants in the Comicvine info for the issue while the baddies I remembered were there right on the cover I thought I had been got by an inside joke of some sort. Um... now we're have a hiccup I guess. "Torment" was the very first arc with Lizard in SM #1-5, whereas the one with Wolverine and Wendigo was "Perceptions" in SM #8-12. Though if one wants to describe the story as torment, I'm in no position to argue. @Teemu: "Torment" was the very first arc with Lizard in SM #1-5, whereas the one with Wolverine and Wendigo was "Perceptions" in SM #8-12. Karound. I guess since the "baggage" has been dealt with, the book no longer has to talk about Ms Pryor as if she were History's Greatest Monster. What's less forgiving is that soon afterwards, Jean's parents full of tactless elation, state something like "Well since Madelyne was a clone of you, that automatically makes Nathan our grandchild. Yay!" Besides the utter callousness of this declaration in context of this issue, the really irritating part is that this erroneous statement (that's not quite how cloning works, even in fiction) has ossified into a status quo that's still referenced to this day. Poor Madelyne now gets to be forgotten about after being (literally) demonized for the past couple of issues as every writer from this point on just states that Jean is Cable's mother as if it were fact. For context, consider that Gwen Stacy gets referenced constantly, despite being dead for decades and Spider-Man having "moved on". Mr and Mrs Greg meanwhile treat Maddie like a nonentity... Moments after her funeral! There's that though that death of Gwen Stacy could be (and have been) argued to be the moment that ended the Silver Age, having been pretty unprecedented happenstance and a defining moment more widely in the comics medium than only for Spidey-Petey. Ahem, anyway, the only thing that could be argued to have started with this death is the Dark Age of Comic Books which is not a thing to be sang about later on. The Image guys are upon us already, and the X-books lately haven't exactly been the pastel-colored 80's stuff. It's like a false dawn took place around, well, "False Dawn", and then some Inferno daemons instead of leaving stayed behind and somehow got themselves tied into the fabric of reality like some sort of third rate ersatz Chthon or something. @Jonathan: Poor Madelyne now gets to be forgotten about after being (literally) demonized for the past couple of issues as every writer from this point on just states that Jean is Cable's mother as if it were fact. I know there's at least a few instances, early in the "it's been established that Cable is Cyclops' son" era, where Maddie specifically cited as his birth mother, not Jean. 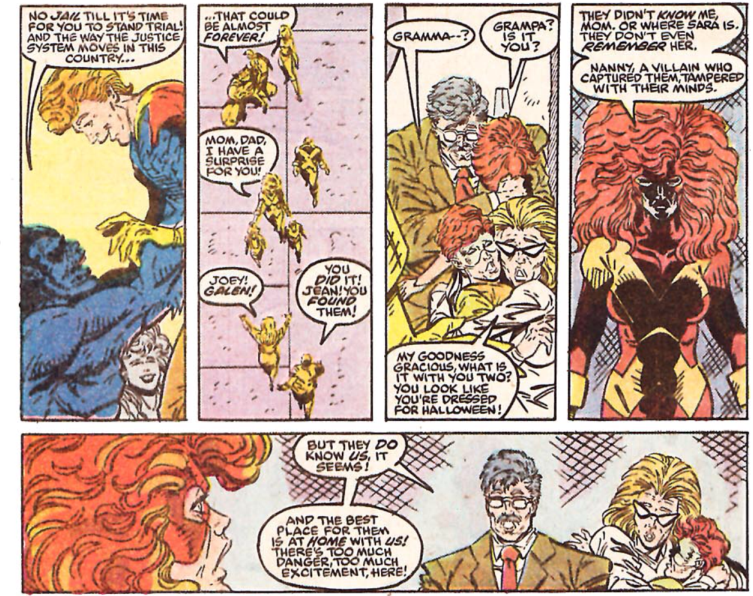 And, of course, Maddie's role as Cable's birth mother gets brought up when the character is resurrected and is palling around with Nate Grey during his series, post-"AoA", the whole fact that she's the mother of his counterpart in her reality lending their interactions an incestuous undertone. What complicates it (and I think intentionally so), is the Adventures of Cyclops and Phoenix limited series, which has Jean (along with Cyclops) basically functioning as Nathan's step parents for the first thirteen years of his life, giving him every reason to think of her as his mother even though it was her clone who birthed her. After that, writers who were probably just referring to Jean as his mother for the sake of brevity had an in-story reason for doing so, making it less egregious if still something of a slight to Maddie herself. I also actually really like Liefeld's early art on titles like X-Factor and Hawk and Dove. It's not bad for a guy in his early 20's just breaking in. It also didn't hurt that he usually had a solid inker on him to fix the weird nuances of his art. I think of him like John Byrne - With the right inker they're great, but I don't like it when they ink themselves (I think Liefeld began inking himself shortly before X-Force). But he just got popular WAY too quickly and by the age of 25 he was a part of Image doing his own thing and being able to draw how he wanted. He wasn't able to get the editorial guidance he needed to grow and develop. And to this day people will still buy his books, no matter how crappy the art looks. I'm of the opinion that a creator's best work will almost always be their own singular vision without excessive interference. But some guys like Liefeld and George Lucas NEED that outside influence to reign them in. Had Image not happened I wonder what Liefeld's art would look like today.